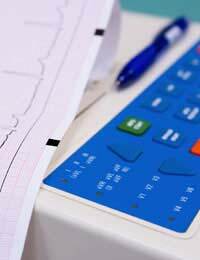 Home > Heart Conditions > What is Bundle Branch Block? Often only diagnosed whilst performing routine tests or screening techniques or whilst investigating other conditions, bundle branch block is a relatively common disorder that affects many people. When the heart contracts, electrical impulses initiated in the sino atrial node, found in the upper part of the right atrium, are sent to the atrioventricular (AV) node from where they travel down a structure called the ‘bundle of his’ after which they are split into the left and right branches and transmit to the left and right ventricles respectively.When bundle branch block occurs these signals down the branches are interrupted and the ventricles may not contract simultaneously as they would normally do. Without any symptoms for many, this condition may only be diagnosed after it is seen on an electrocardiogram (ECG), which may have been requested for other reasons.Bundle branch block may occur on the left side or the right. There are many reasons why bundle branch block occurs and its diagnosis may depend on whether the block is found to be in the left branch or the right. Right bundle branch block has been found to occur in those with diseases of the right side of the heart or lungs and investigation into these possibilities should be carried out if right bundle branch block is seen. For many though, right bundle branch block may occur for no apparent reason and specialists are often satisfied to accept this as normal for that individual. If left bundle branch block is seen, it is often a sign of underlying heart conditions and further investigations should be performed to determine the cause so that treatment can begin before the causing disease deteriorates. Very rarely, both branches can become totally blocked causing the ventricles to stop contracting properly or at all, in which case the heart stops and death can occur without immediate medical intervention. Heart block can occur in varying degrees, from being a minor ‘hiccup’ in the heart’s wiring system, to complete block when no impulses can get through. For some, there will be no noticeable symptoms, whilst for others, especially those with most severe types of heart block, the ventricles may contract a lot fewer times in a minute than they should, so tiredness, dizziness and breathlessness may occur.Other symptoms may vary and depend on the cause of the condition such as an underlying cardiac problem. For those who have heart block for no apparent reason, treatment is often not needed. For others, the cause of the heart block, such as other heart or lung problems, will need investigating and treating before they can develop further. If the heart block is severe and causing symptoms, the use of an artificial pacemaker may be suggested, allowing the device to take over the task of electrical impulse transmission meaning the heart chambers contract as normal. Heart block can be a relatively uncomplicated and often not dangerous occurrence in many people, for others it may be a sign of more serious conditions that will need investigating and treating.